(L-R) The nominees: Donell John Pacris-Siazon (fourth nominee), Robert Mendoza (third nominee), Maristela Presto-Abenojar, RN, MAN (second nominee) and Dr. Joseph Carabeo (first nominee). 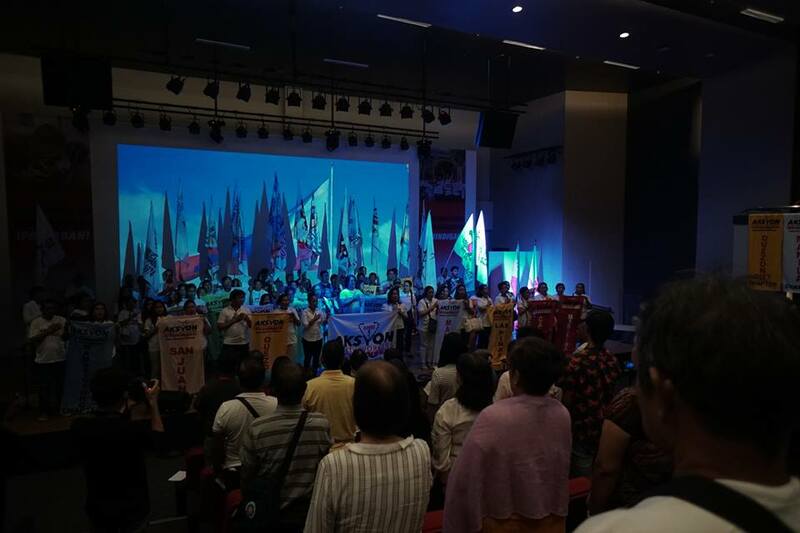 MANILA – Staunch advocates of the people’s right to health is taking their battle to the next level as they join the legislative arena in the 2019 elections. 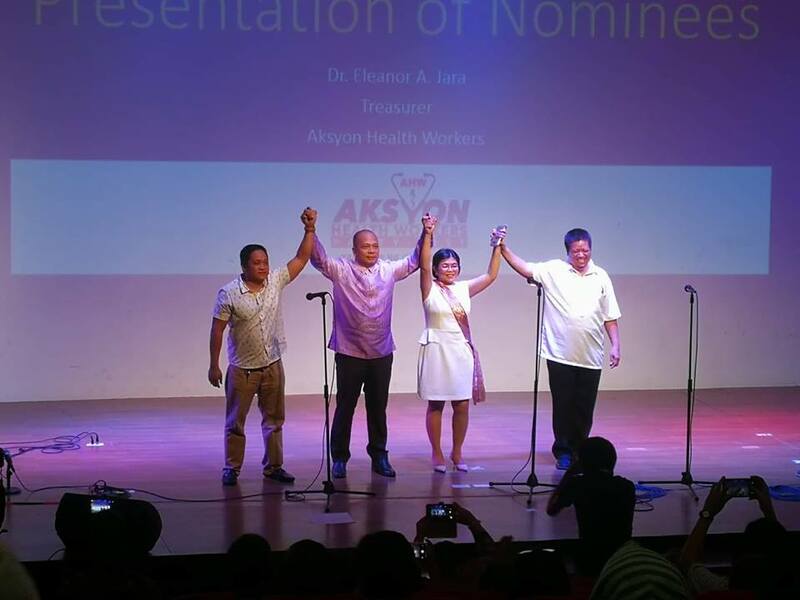 Aksyon Health Workers Partylist, a partylist group founded by health workers the advocacies of which also include social change for a healthier Philippines, is ready to take the challenge to push for pro-people and pro-health workers bills in Congress. “We are a partylist not only of health workers but of the Filipino people,” said Maristela Presto-Abenojar, RN, second nominee of the Aksyon during their national convention last Saturday, Sept. 22 at the Philippine Heart Center in Quezon City. Aksyon is composed of health professionals, health workers, health students including their relatives, patients and clients, and individual health advocates of people’s health. Their platform is anchored on their mission to provide health services that are free, comprehensive and accessible to the Filipino people. At the same time, it is pushing for adequate salaries and the right to security of tenure for all health workers and professionals from private and public hospitals. Community doctor Joseph “Jojo” Carabeo, Aksyon’s president and first nominee, described their partylist as a neophyte in this new path that they are taking. But for the past four decades, these health workers have been working in communities of the most vulnerable and marginalized. Since 1973, groups of progressive health workers have been delivering health services to the most neglected areas in the country through the community-based health care program (CBHP). The CBHP is a health program implemented by local organizations in the provinces. Community organizations are being trained and empowered by health workers. Aksyon also responded in areas heavily damaged by calamities. Carabeo said Aksyon has been in the forefront of relief and rehabilitation efforts after the 1990 Baguio earthquake and 1991 Mt. Pinatubo eruption. 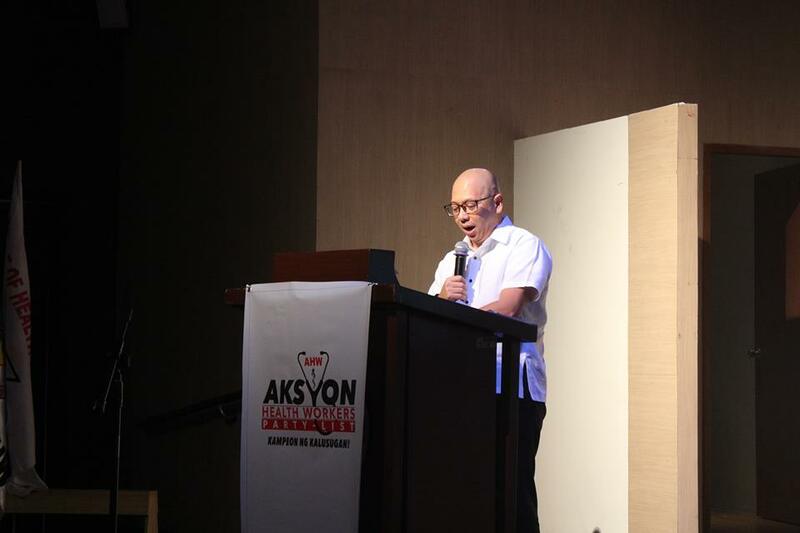 “Aksyon also responded to the affected areas of the typhoon Ondoy and Yolanda,” said Carabeo. Not only do they deliver health services to the marginalized but also actively joined the fight against privatization and corporatization of public hospitals. Aksyon was also steadfast in the health workers’ fight against privatization of the National Center for Mental Health and Dr. Jose Fabella Memorial Hospital. “We also actively campaigned and participated in the sit-down strike of patients, employees and health workers of the Philippine Orthopedic Center,” Carabeo added. Aksyon also took the lead in demanding justice for children who were inoculated with Dengvaxia vaccine in 2016. “Our actions together with victims of the anomalous Dengvaxia vaccine contributed to the strong public outcry for the government to provide supplemental budget and free health services for the children,” said Carabeo. Carabeo said health workers have also utilized the legislative arena in actively campaigning and lobbying for the rights and welfare of the health workers. In 1992, the Magna Carta for Health Workers was enacted through the efforts of the Alliance of Health Workers founding president and constitutional commission delegate Minda Luz Quesada. Health workers and health professionals also strongly opposed the Salary Standardization Law of 1989. They also succeeded in their campaign to retain the P1.5 billion ($27 million) slashed budget of the Department of Health for maintenance and other operating expenses (MOOE) in 2016. 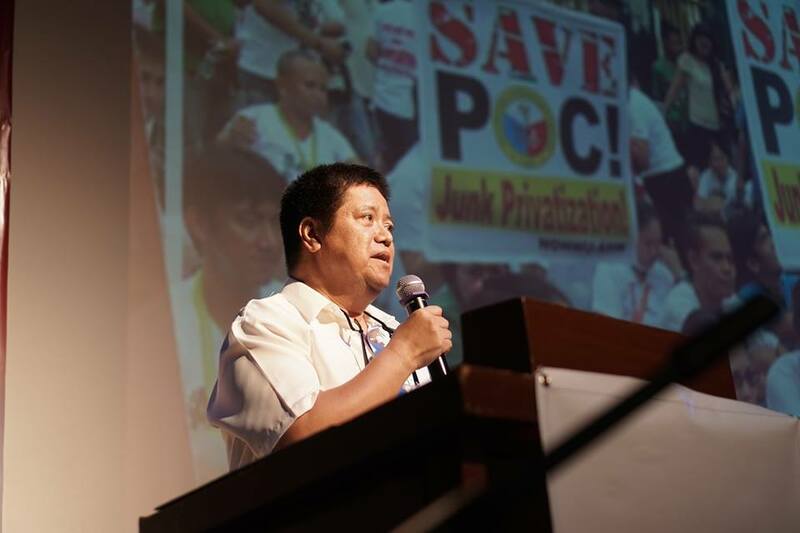 They also campaigned for the passage of House Bill 7437 or the Act Prohibiting the Privatization and Corporatization of Public Hospitals, Facilities and Health Services, in the House of Representatives this year. Health workers also took the lead in the campaign to release the illegally detained health workers in Feb. 2010, collectively called as Morong 43. At present, health workers under Aksyon still continue the fight for higher wages and accessibility of health services for the poor. Among their nominees are: Carabeo, who has been a doctor for three decades. He is involved in different coalitions against privatization of public hospitals. He was a former president of Pasay-Paranaque Medical Society from 2007 to 2008 and the Community Medicine Practitioners and Advocates Association from 2009 to 2017. He is the present lead consultant for Health Affairs of Bayan Muna Partylist. Abenojar is the present secretary general of Aksyon Health Workers and vice president of the Filipino Health United. She is also a former executive director of the Philippine Nurses Association (PNA) in 2007 to 2011, Technical Coordinator for Luzon of the 6th Country Program United Nation’s Population Fund from 2012 to 2013, Provincial Health Program Officer III of Luzon Health Project Research Triangle Institute and United States Agency for International Development in 2013-2016 and Director III under the Office of the Secretary, Department of Social Welfare and Development (DSWD) Central Office in 2016-2017. Their third nominee is the present national president of the Alliance of Health Workers and a registered midwife, Robert Mendoza. He is also the present president of the Philippine League of Government and Private Midwives, Inc. – NCR Hospital Based; former president of Philippine Children’s Medical Center Employees Association – Alliance of Health Workers, Inc.; and member of the International Confederation of Midwives. Registered social workers, Donell John Pacris-Siazon is its fourth nominee. He is the present Medical Social Worker at the University of Sto. Tomas Hospital since 2005. He is also a member of the Philippine Association of Social Workers Inc., Association of Medical Social Workers of the Philippines Inc., Ugnayan ng Nagkakaisang Manggagawa – UST Hospital and the Philippine Dragonboat Rowing Team – Fireblades. Carabeo challenged its members to unite and show its strength in winning three seats in the House of Representatives. “Let us now, health workers, professionals, students and advocates publicly manifest our moves to level up the health sector’s work for meaningful health and social reforms through our own party-list and nominees,” said Carabeo.